A system of 946 unique panels will produce optimal acoustics and aesthetics at the University of Iowa’s new School of Music. For a 700-seat concert hall at the new School of Music at the University of Iowa, Seattle-based LMN Architects wanted to design a high-performing ceiling canopy that would unify the many features of traditional theatrical and acoustic systems. 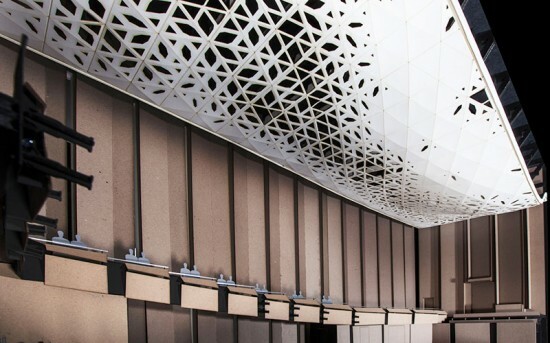 The result is a 150-foot-long by 70-foot-wide surface composed of 946 suspended, intricately laced panels that incorporate complex, interdependent, and at times conflicting systems—including lighting, theatrics, speakers, sprinklers, and acoustical functionality—in a unified architectural gesture. “The system is sculptural for sure, but it had to conceal structural truss work, which was a major cost savings as opposed to building an acoustic container,” said Stephen Van Dyck, a principal at LMN Architects. The design team worked with both parametric digital and physical models to coordinate the structural system with the acoustic, theatrical, audio/visual, lighting, fire, and material elements of the canopy. “From Day One, it was a digital model,” he said. 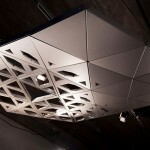 “We needed a smaller physical model to get everyone’s head around making this happen physically. A three-foot room model has a big impact on ability to conceive.” LMN fabricated the scale model, as well as a few full-sized components, on the firm’s 3-axis CNC mill. The many consultants who contributed to the design worked in different digital formats. 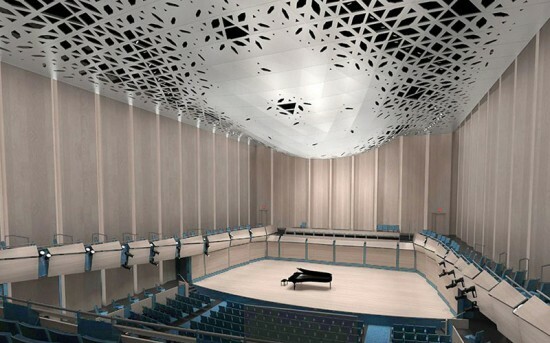 The acousticians used SketchUp; the lighting designers worked in Revit; and theater and audio/visual specifications were saved as DWG files. Each program was compatible with Rhino and, with a Grasshopper plugin, LMN was able to incorporate information from all other platforms. “The parametric model was very flexible and let us accommodate changes all along as developments came from other contributors,” Van Dyck said of the design process, which he described as more cyclical than linear. 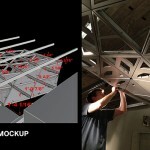 The parametric capabilities of the digital tools that the team used helped facilitate a smooth and efficient documentation process during the mock ups, making it easy to go back through any kinks that were uncovered. 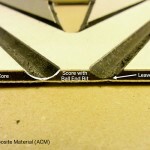 LMN built the mockup from aluminum composite paneling, a relatively inexpensive metal system composed of two layers of aluminum with a composite core. 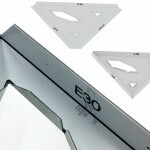 The material is highly flexible and it can be bent by hand after scoring on the CNC mill. 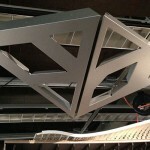 This process could potentially eliminate on-site fabrication requirements. 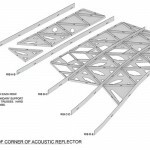 Fabrication data generated by this production model will be applied to all 946 of the unique panels in the final project. 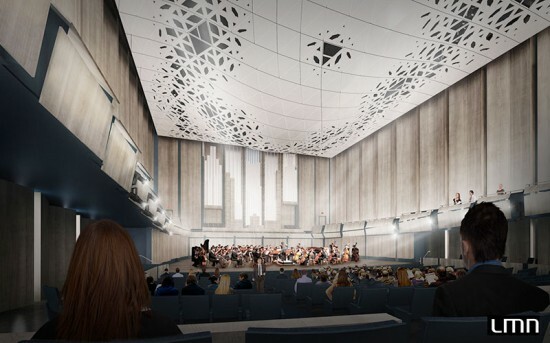 Documents will go to bid this summer, and the building is expected to open in 2016.